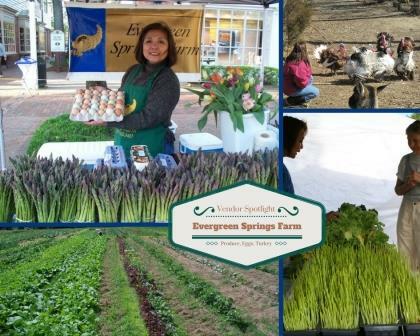 Evergreen Springs Farm is located on 15 acres on the south end of New Kent County in Barhamsville, VA. When Marlene and her husband saw the property in 2004, they fell in love with the opportunity to start reducing their dependency on commercial consumption. The first thing they built was the chicken coop, for fresh eggs. They then planted a half-acre of asparagus and set up an acre for growing fresh veggies. They kept growing, and before they knew it, they had about 100 chickens, 75+ turkeys, 20 geese, 12 peacocks, 7 ducks, and two goats. Marlene says this lifestyle may not be for everyone, but for Marlene and her husband, it is a labor of love. They get gratification of knowing they eat chemical-free food and the animals live a humane life, and they are happy to share all of this with their friends at the market.